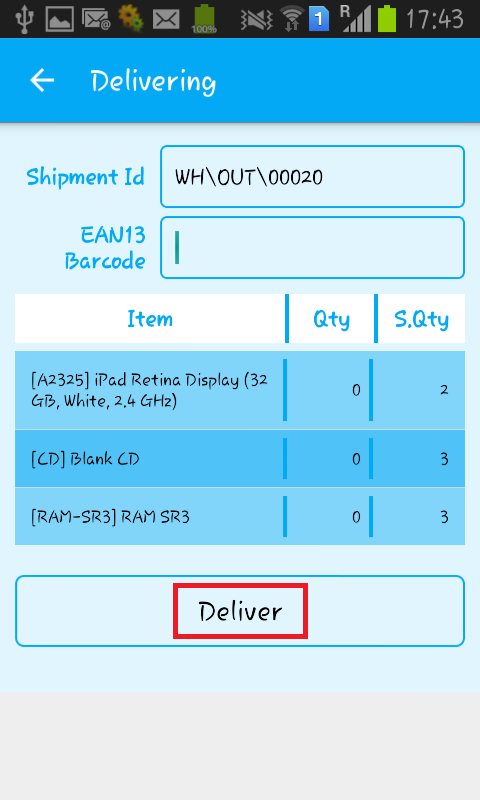 Install our customize Sales Order Mapping Module. Now you can see fields which are required to map from CSV files. Now you can use wizard to select Shop and Related CSV files for Importing Sales Order in Odoo. 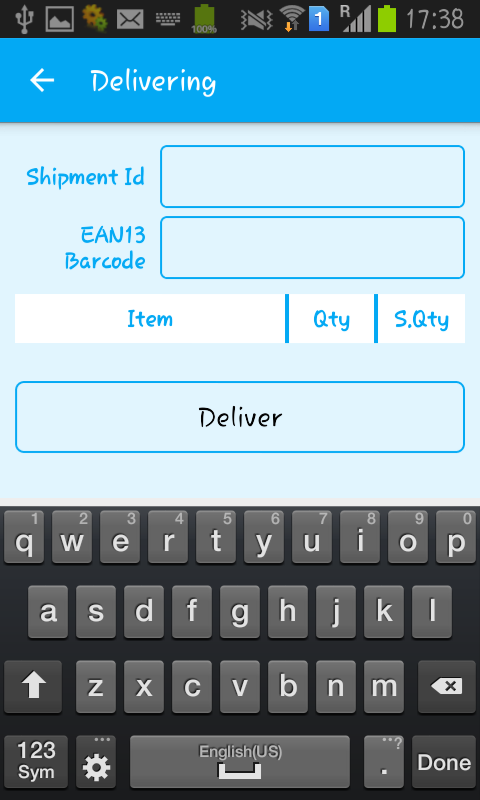 Once you use this Do mapping Button it will create Orders as Quotation.This Order can be imported as confirmed Sale Order or paid order based on configuration done for particular shop. We at Teckzilla, a leading provider of latest open source software, help our clients to effectively manage their businesses by offering them an opportunity to avail our Enterprise solutions, Sales management software, and work flow tools. All our services, including Odoo, an Open source ERP software, enable them to handle all their vital departments proficiently. ERP software (Enterprise Resource Planning) is counted amongst the most important tools, when it comes to smooth functions of different business operations and processes in the best possible way. We believe in establishing trustworthy relations with our clients which is why, we provide you with the best Enterprise Resource planing software, an Open source ERP software that consists exceptional features and can also make you achieve your business objectives and goals by fulfilling all your business needs. You can also create a connection with your Amazon stores with the help of Odoo. In addition to this, you can also contact our experts if you need to have integration of Amazon and Odoo (OpenERP). Just like Amazon, we can also integrate eBay stores with Odoo so that you can efficiently carry out eBay payment operation right within Odoo without login into your Ebay account. Besides providing enterprise tools, Teckzilla also performs the integration process with third party tools and software through customizations in accordance with the requirements of your business or firm. Our experts have years of forte and experience under their hats in creating and implementing business applications of highest enterprise grade. Apart from this, we also offer consulting and business analysis services both on-site and offshore. Quickbooks is one of most Popular accounting system in USA. Odoo is seamlessly integrated with quickbooks. Major Features for Quickbooks Odoo Integration. Importing all the Invoices from Quickbooks into Odoo. Importig of Customers from Quickbooks into Odoo. Importing of Vendors from Quickbooks into Odoo. Importing of Chart of Account from Quickbooks into Odoo. This app is designed to receive and deliver the products. In this App each product gets scanned by providing EAN13 barcode. Following is the steps to use the app. Step 1 : Start the WMS App. You will see the following “Login” screen. Step 2 : From the above screen press the “Settings” icon like this. Step 3 : You will see the following “Settings” screen. 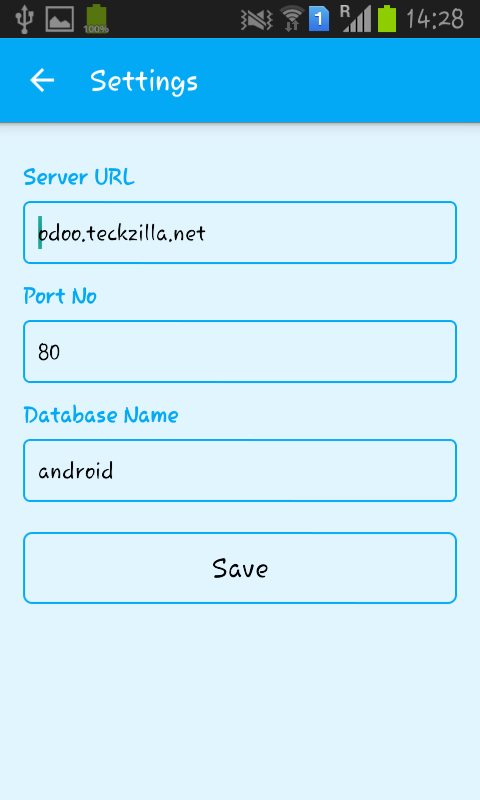 Step 4 : In Settings screen provide the “Server URL”, “Port No”, “Database Name”. After that press “Save” button. 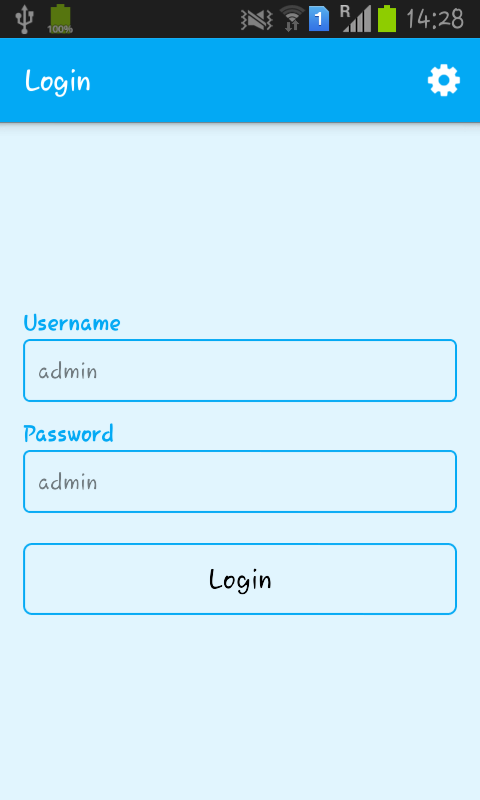 Step 5 : In Login screen provide the “Username” and “Password” for the database you have set in the “Settings” screen. After that press “Login” button. You will see the following screen. Step 6 : From the above “WMS” screen i.e. “Dashboard” screen you can go for “Receiving”, “Delivering” or “Logout”. 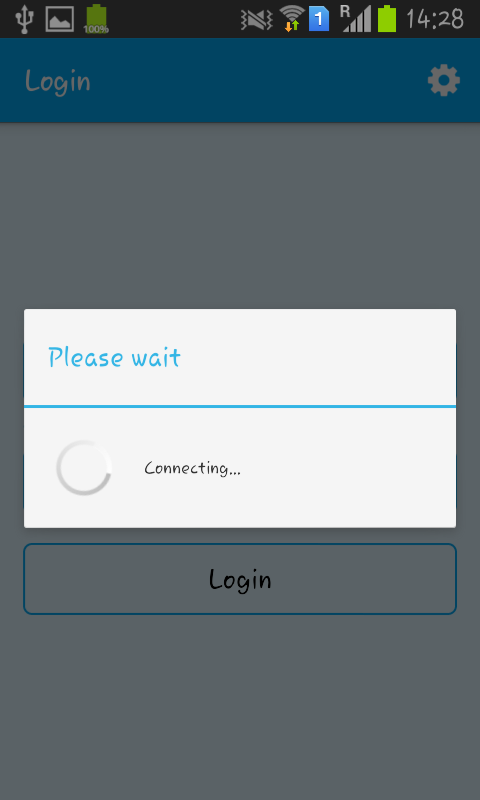 If i press the “Logout” icon then following popup will appear. 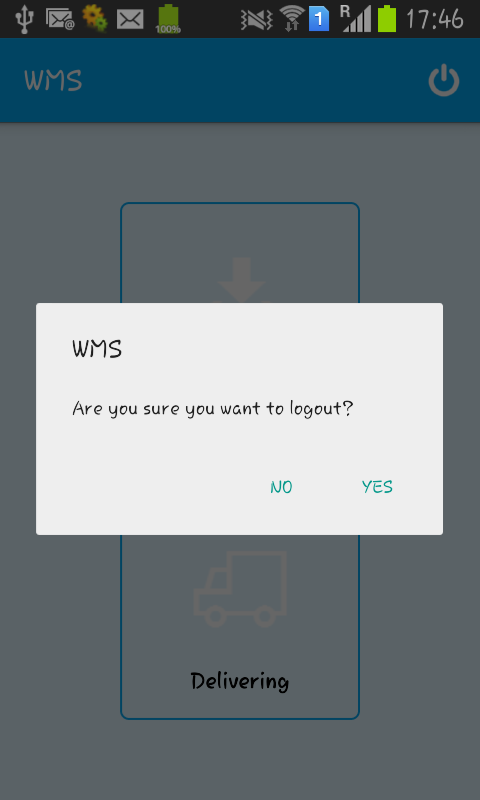 Step 7 : In the above popup if you press the “YES” button then you will get logout from the app or if you press the “NO” button then you will remain in the same screen i.e. “WMS” screen like the following screen. 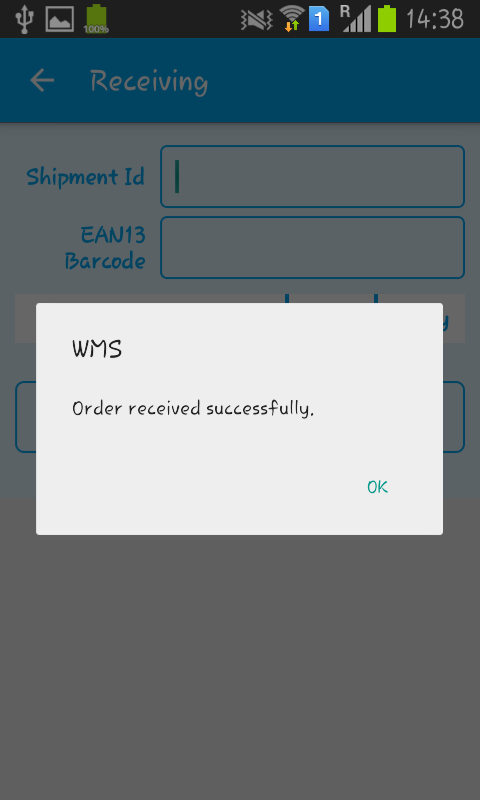 Step 8 : From the above “WMS” screen if you press the “Receiving” icon then following screen will appear. 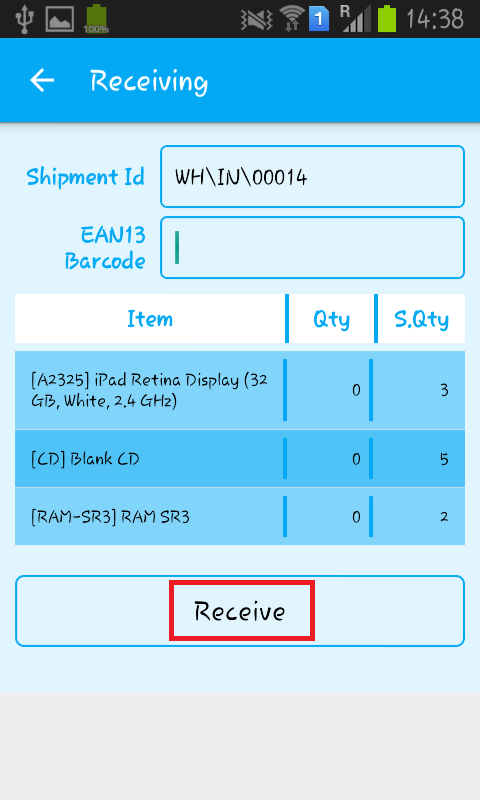 Step 9 : From the above screen as you see it ask for “Shipment Id” and “EAN13 Barcode”. 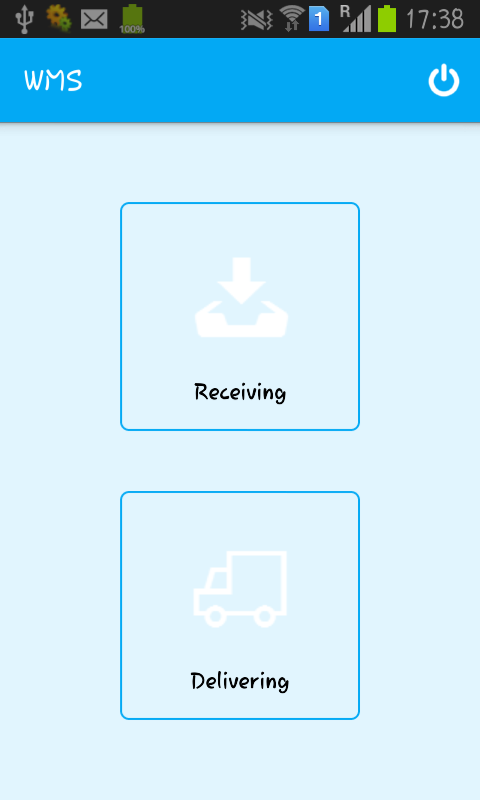 First of all you have to provide the correct “Shipment Id” after that you have to press the “Done” button from the keyboard as showing in the following screen. 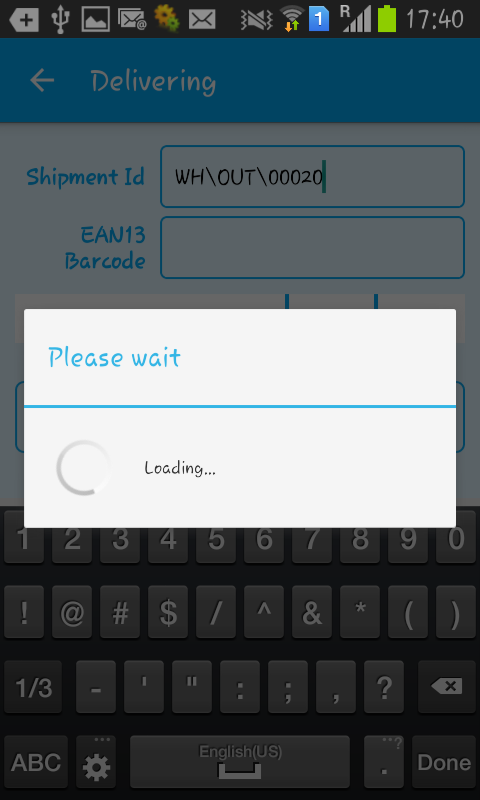 Step 10 : After pressing the “Done” button please wait while the “Shipment Id” is get validated and if the “Shipment Id” is valid then following screen will appear with Products List. Step 11 : In the above screen as you see there are list of products are get loaded which is associated to “Shipment Id”. The product list contains three columns as item title, quantity and scanned quantity. 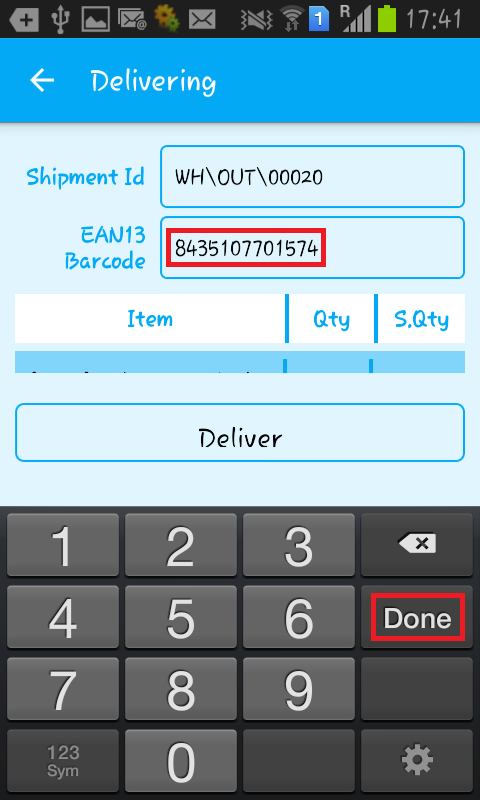 Now you have to provide “Ean13 Barcode” and press “Done” button from the keyboard. 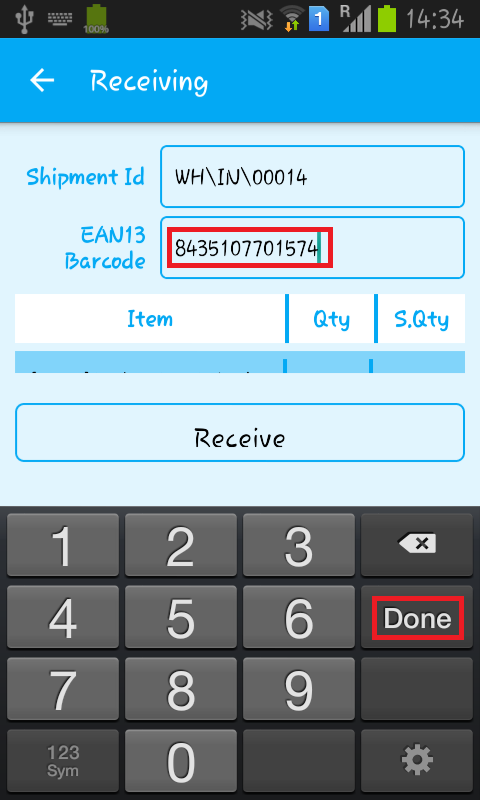 If your “EAN13 Barcode” is correct then you will listen an voice “Next” and “EAN13 Barcode” text editor get cleared. After that you must have to provide next “EAN13 Barcode”. As the all products are get scanned you will see the following screens. Finally all the products are get scanned. Step 12 : After this press the “Receive” button. By pressing the “Receive” button you will see the following popup. Now the receiving of the product is done for the above “Shipment Id”. If you want to receive more products then go ahead and follow the steps from “Step : 9” to “Step : 12”. Step 13 : Now If you want to go to your dashboard screen then pressed the back button or from the top left of the screen back arrow is there you press this also for back. After that the dashboard screen is appeared. Now if you pressed the “Delivering” icon then following screen will appear. Step 14 : From the above screen as you see it ask for “Shipment Id” and “EAN13 Barcode”. First of all you have to provide the correct “Shipment Id” after that you have to press the “Done” button from the keyboard as showing in the following screen. 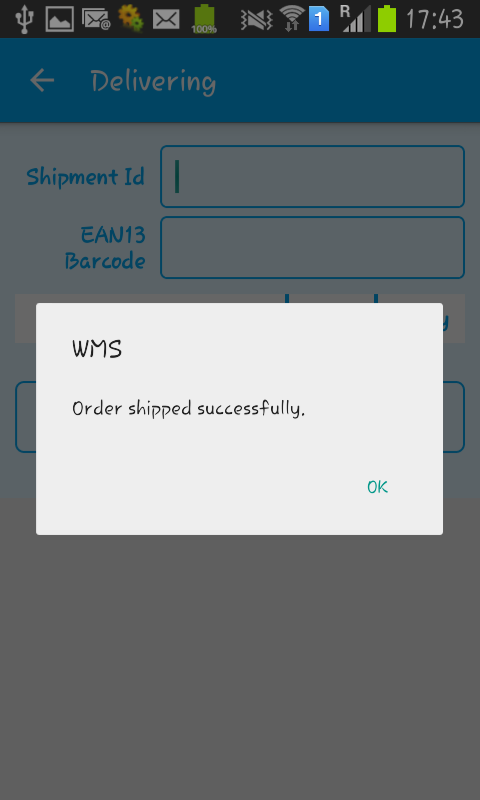 Step 15 : After pressing the “Done” button please wait while the “Shipment Id” is get validated and if the “Shipment Id” is valid then following screen will appear with Products List. Step 16 : In the above screen as you see there are list of products are get loaded which is associated to “Shipment Id”. Step 17 : After this press the “Deliver” button. By pressing the “Deliver” button you will see the following popup. 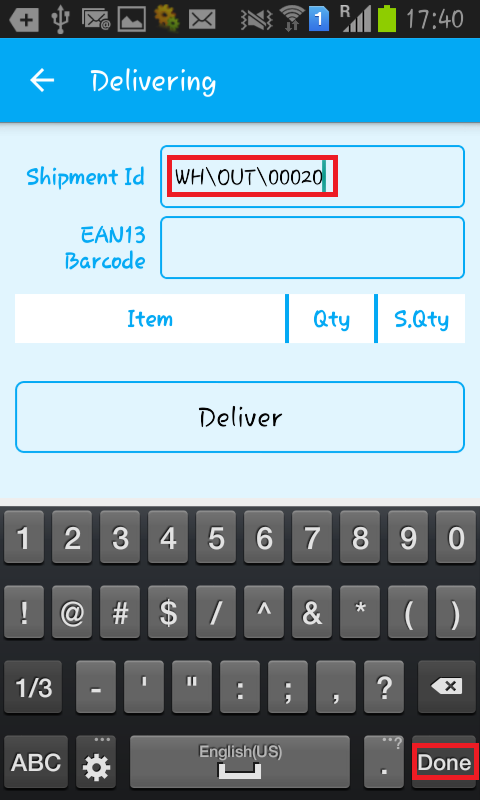 Now the delivering of the product is done for the above “Shipment Id”. If you want to deliver more products then go ahead and follow the steps from “Step : 14” to “Step : 17”. Palletway is one of the most popular and highly used shipping service in UK. Odoo is Integrated with Palletway to seemlessly carry out Shipping within Odoo. You can generate Quotes for different shipping services and choose the best shipping service.